Last night the Lake Erie Monsters advanced to the second round of the AHL playoffs, defeating the Rockford Ice Hogs in a sweep, beating Rockford 5-2, 5-1, and 5-3. 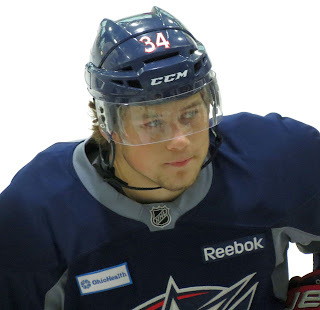 Josh Anderson finished the series with a hat trick in Game 2, and a Power Play goal in Game 3 to spark the Monster's to the series win in the five game series. The next round becomes seven game series. Joonas Korpisalo was very solid in net, which is a great thing to see for the Blue Jackets organization. Another really good thing to see was the play of Anton Forsberg down the stretch for Lake Erie. While Korpisalo was playing well in the NHL, Forsberg shook off a mid-season slump, and was extremely effective in net down the stretch. This is just a really good thing for the organization, and I am looking forward to the next round. Grand Rapids is up on Milwaukee 2 games to 0 in that series, so the Monsters have a bit of a break ahead of them. It's really nice to see the fire power the Monsters are showing. Hopefully some day that transfers to the NHL. Way to go Monsters! A quick note about the summer schedule. As a one man show, I'm not going to worry about a steady string of content over the off season. I'll get a thing up here and there, and of course the pace will pick up around draft day and free agency. And likely I'll pipe up to cheer or moan about the results of the lottery. And I have another 'Definitive History' piece or two to do. Probably save that for August, when its really slow. Good luck in the next round Lake Erie! Welp, 2015-16 NHL Season Mercifully Ends for CBJ.